As you may know, I'm an editor on an amazing and wonderful social networking site, Kirtsy. There are many perks to the job, not least of which are the FABULOUS ladies that I work with. Another recent perk was an introduction to the One2One Network, "a national matrix of thousands of socially-connected women who actively promote products and services they believe in." The introduction came with one pretty spectacular bonus ... a new printer! I was in desperate need of one. Mine was kaput, and I have been forced recently to print invitations and the like from an area printer. Well, phew, those days are in the past. 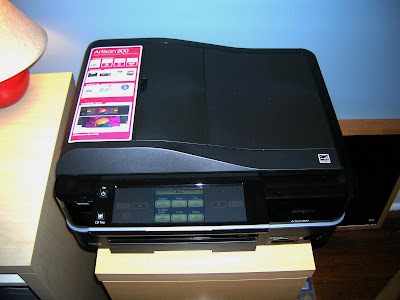 I now have Epson's Artisan 800 All-in-One printer. You may think I'm just saying fabulous things because I got a new printer ... I'm really not that easily won over, and I totally would have been a crank if this thing wasn't so ridiculously cool. In addition, the printer is WiFi, so I'm literally hooked up now and it's printing upstairs. Pretty stinkin' cool! So, if you're in the market, be sure to look here for more information! Also, stay tuned because I'm be featuring some printing projects in the next few days! From time to time you may see product reviews from me now, but I promise you this ... I will not be biased. If I don't think something is up to par, I'm going to warn you! And, if you're interested and have time, be sure to check out the One2One Network and sign up to participate as well! 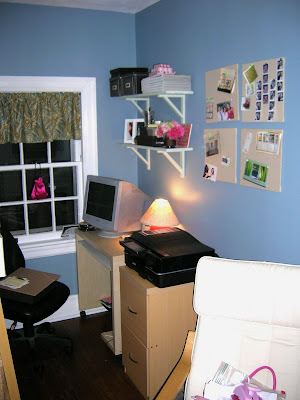 cute office! love the color on the walls!